Josh G. — Ascend P.T. Heather is an absolutely incredible PT. I have worked with several PT's over the last few years recovering from two major surgeries and no one even begins to compare to her in terms of knowledge, professionalism, availability, or overall care for the patient. 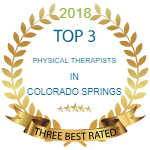 I give Ascend Physical Therapy, and Heather in particular, my highest recommendation without any reservations.